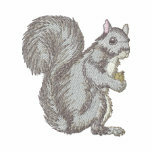 The Eastern Gray Squirrel is the most common squirrel in the Northeastern United States. I have always been fascinated by these clever and comical creatures. I once spent the better part of a vacation sitting on the steps of the rental house and hand feeding a large group of tame squirrels. I was delighted by their silly antics, the way they would all gather round, chattering and scuffling waiting for their own turn to be handed the coveted peanut. It should be noted however, the most common squirrel bite is from hand feeding. Squirrels rarely look at what they are eating; they are too busy watching for predators. 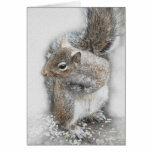 The Eastern Gray Squirrel (Sciurus Carolinensis), is a member of the rodent family. Despite its name, the gray squirrel is not always gray. 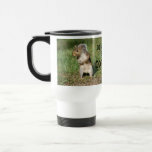 There are also beige, black and rust colored gray squirrels. The gray squirrel molts twice a year which also changes its coloring slightly. In the summer it often has a reddish tinge, while in the winter it is normally a more silver gray. They normally have a white belly and a large bushy tail. As with all squirrels the tail serves the squirrel in many ways. It helps to keep them cool by shading them in the hot summer, helps to keep them warm and shelter them from snow in the winter, they use it as a form of communication, and of course it helps to guide them when they are jumping or climbing. The squirrel’s body is 8 to 10 inches long; its tail is 7 to 10 inches long. They weigh between 12 and 24 ounces.They are diurnal rodents and are active year round. They have good eyesight, an excellent sense of smell and are skilled climbers and jumpers. They have long hind legs and short front legs which aids them in their jumping abilities. Their back legs are double jointed which helps them run up or down surfaces easily. Squirrels are very acrobatic, they easily navigate trees, vines, telephone wires, and brick walls. They can jump a distance of 10 feet from tree to tree; they can jump straight up in the air to about 5 feet. 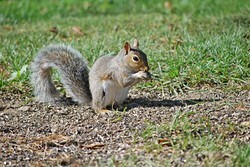 The Eastern Gray Squirrel is highly adaptable and can be found living in both rural and urban environments. They are happiest in forest settings with oak and hickory trees. The Eastern Gray Squirrel lives in two types of dwellings, dens and nests. Dens are holes created in trees. The Nests, which is called a drey, are built with leaves and sticks high up in trees. Squirrels like a clean nest, if it becomes infested with parasites, the squirrel will move or build a new nest. The diet of the Eastern Gray Squirrel consists mainly of nuts, berries and fungi. On rare occasions if food is scare they will eat bird eggs and insects. They are opportunistic feeders and will eat a variety of human foods as well such as pizza crust, crackers and bread. They are hoarders, hiding food in various places. Before the squirrel hides the nut, it will clean it, rubbing it on its face or licking it to transfer it’s scent to the nut. This action helps the squirrel to find the nut at a later time. Even with their excellent sense of smell, squirrels never recover all of their hidden food, which is a benefit to us. Squirrels are responsible for planting many of the trees we now enjoy. Many people complain about squirrels raiding their bird feeders, and engage in a constant battle of man vs squirrel! One option to deter squirrels is to add a squirrel feeder. Give them their own place to eat and they will start leaving your bird seed alone. 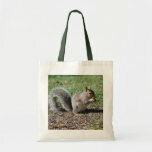 Eastern Gray Squirrels are really a joy to watch, they are clever, energetic and amusing. It is interesting to watch and listen to their communications; they make a variety of vocalizations, tail waving and even the occasional foot stomp. You may just find you actually enjoy watching them as much as the birds. Please May I have a Snack? 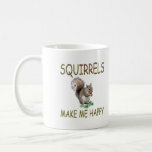 We have both grey and black squirrels in our area...plus a few that look red. Good information and photos! We have the regularly colored gray squirrels and also the black variation in our yard. But they also have to compete with the larger fox squirrels, so they often stay more in the wooded areas where the fox squirrels don't go. I don't mind too much if they get into the bird feeders, but maybe I'll get a squirrel feeder especially for them!